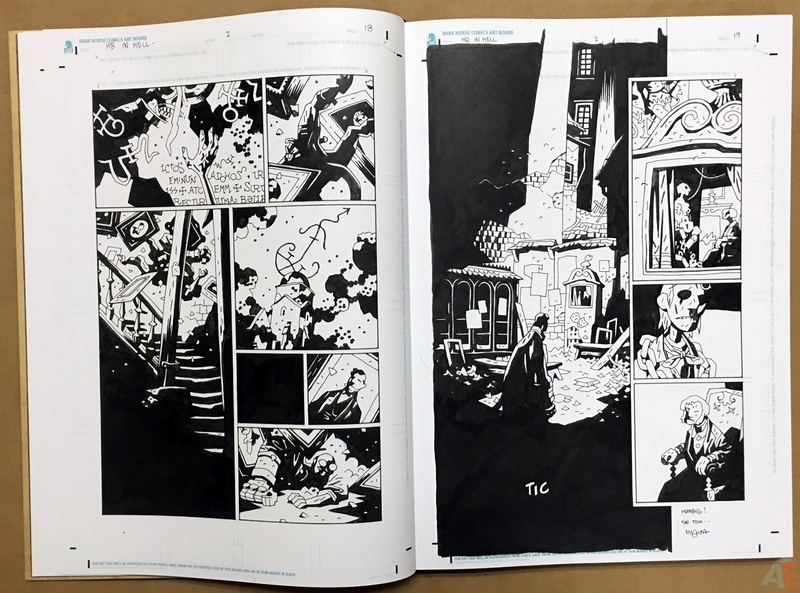 Mike Mignola is one of the preeminent comics creators of the past 25 years. 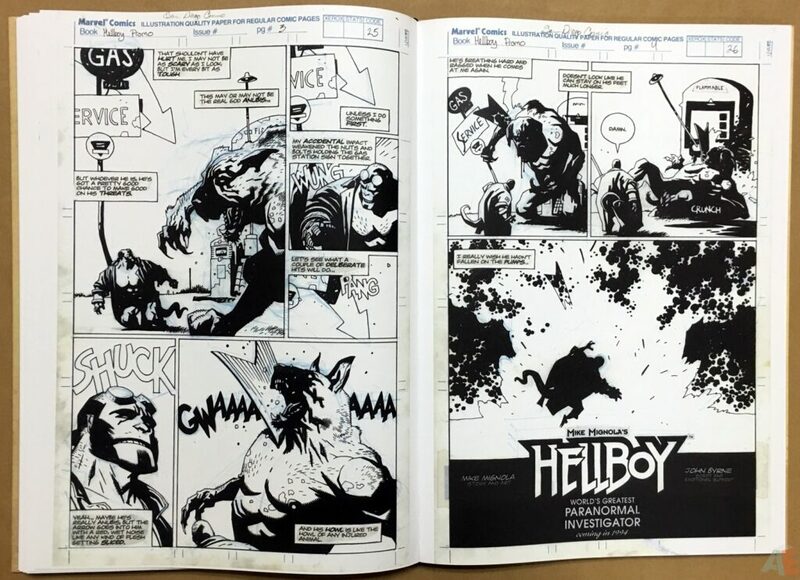 His career was already firmly established for his outstanding work on characters like Batman, Wolverine, a myriad of beautiful covers and more… And then came Hellboy. 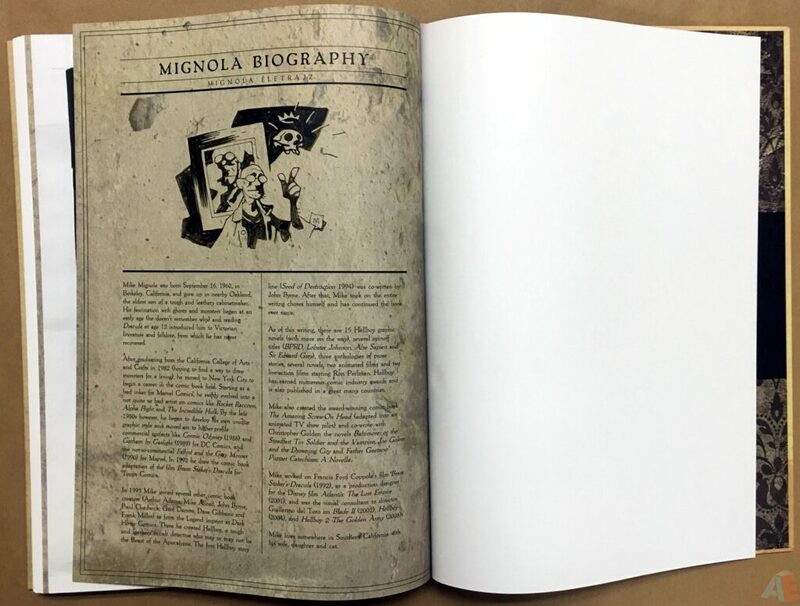 Mike’s iconic creation struck a meteoric chord with fans from the very start and has not abated in the 20 years since his debut. 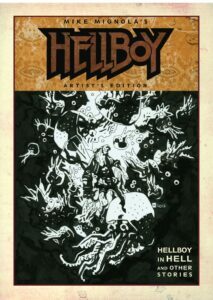 This Artist’s Edition features the first five issues of Hellboy in Hell as well as a wealth of historic supplementary material: the first three Hellboy stories—the two initial four-pagers, produced for promotional purposes, and the 10-page story from John Byrne’s Nextmen #21—plus The Corpse, and two other tales selected by Mignola for inclusion. 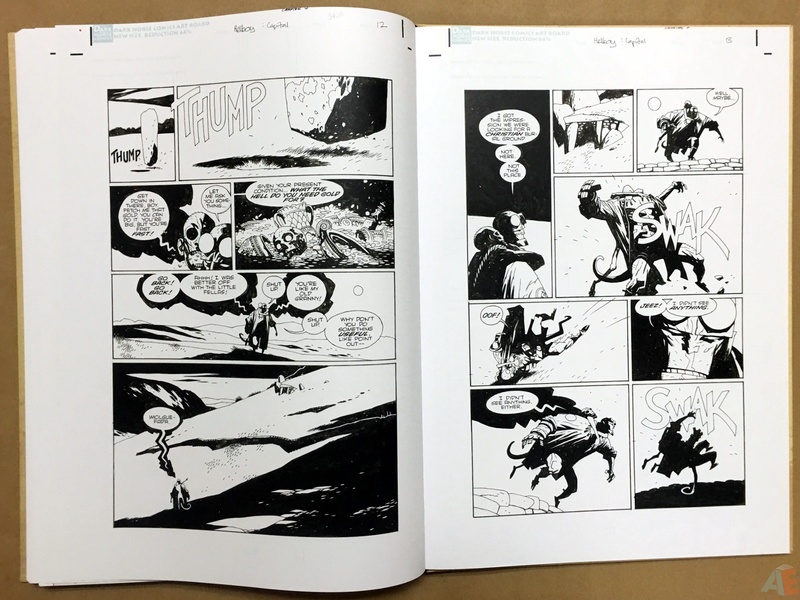 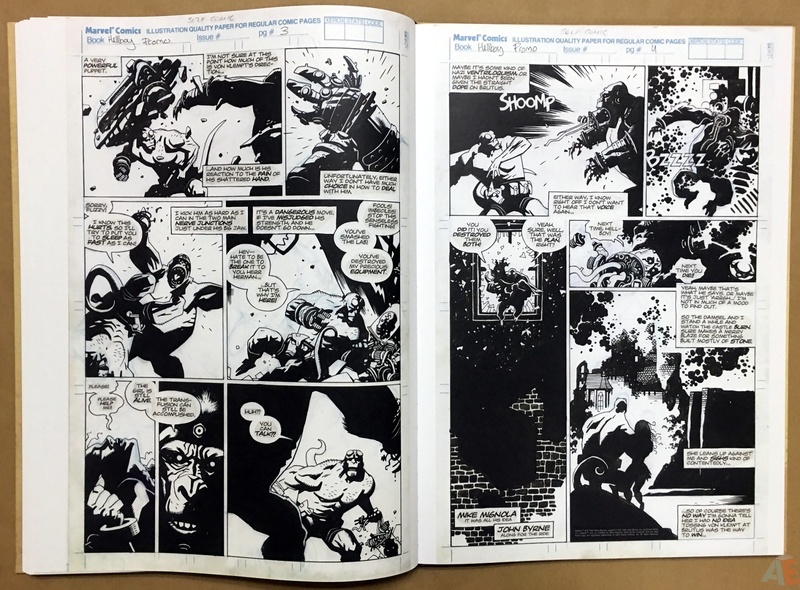 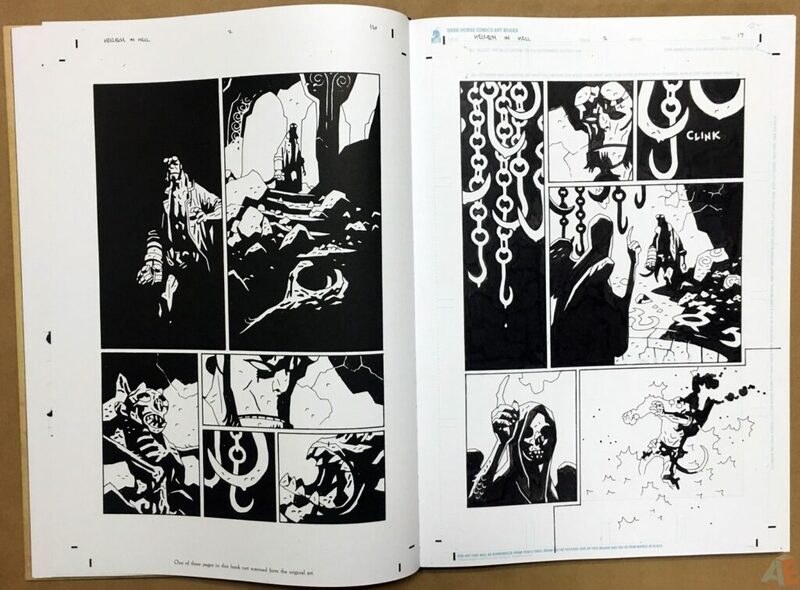 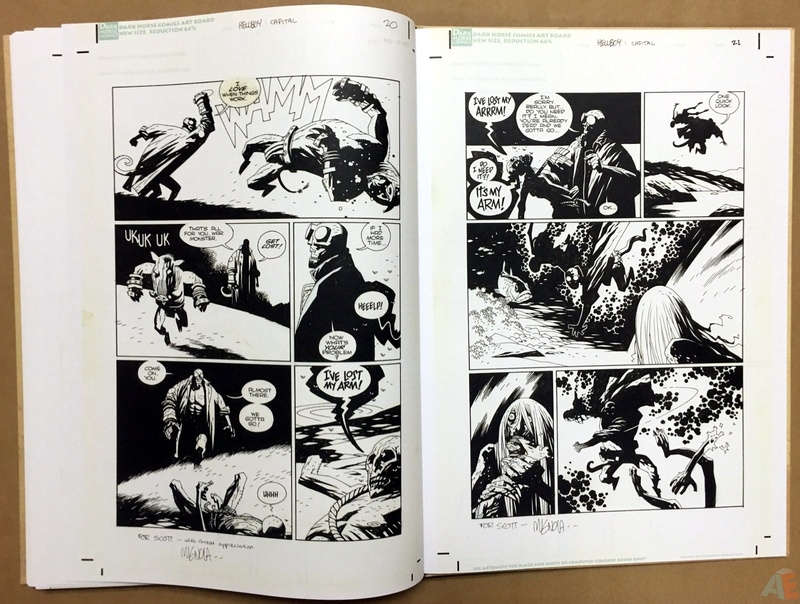 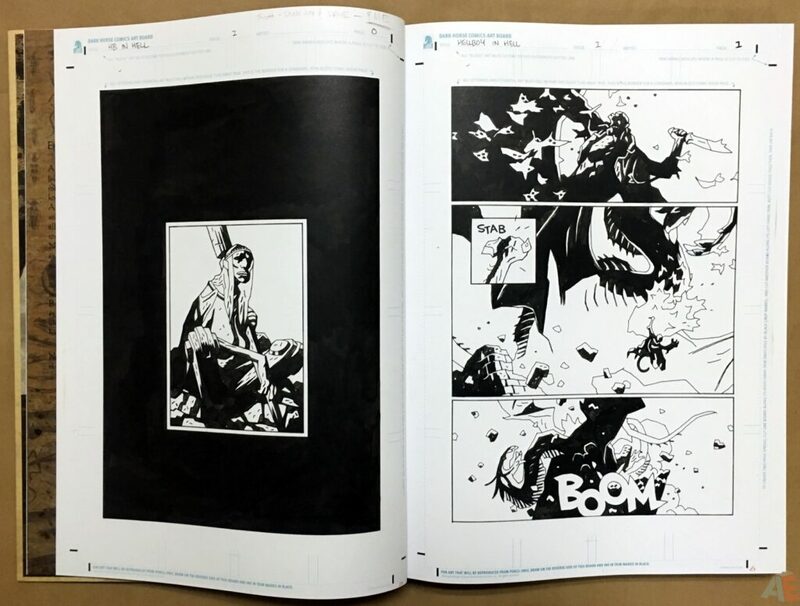 All but three pages of Mike Mignola’s Hellboy Artist’s Edition have been shot from the original art and showcases Mignola’s gorgeous work as closely as possible to the physical page—this is a book for fans of great storytelling and students of the craft. Well designed and produced, Mike Mignola’s Hellboy In Hell And Other Stories Artist’s Edition has a major flaw. 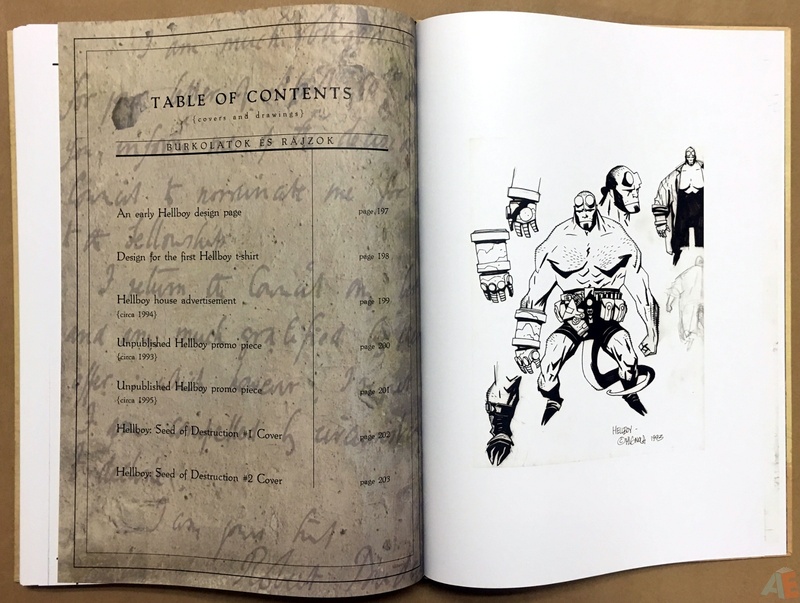 I gleefully opened my copy of Mike Mignola’s Hellboy In Hell And Other Stories Artist’s Edition, enjoying each page as I flipped through the table of contents and indicia beautifully designed by Randy Dahlk. 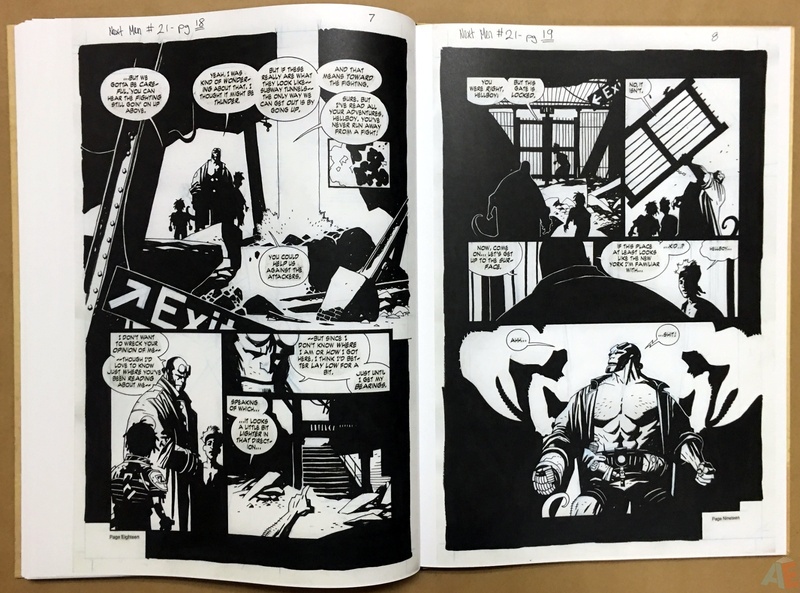 I landed on the first page of Hellboy In Hell and noticed there was not text. 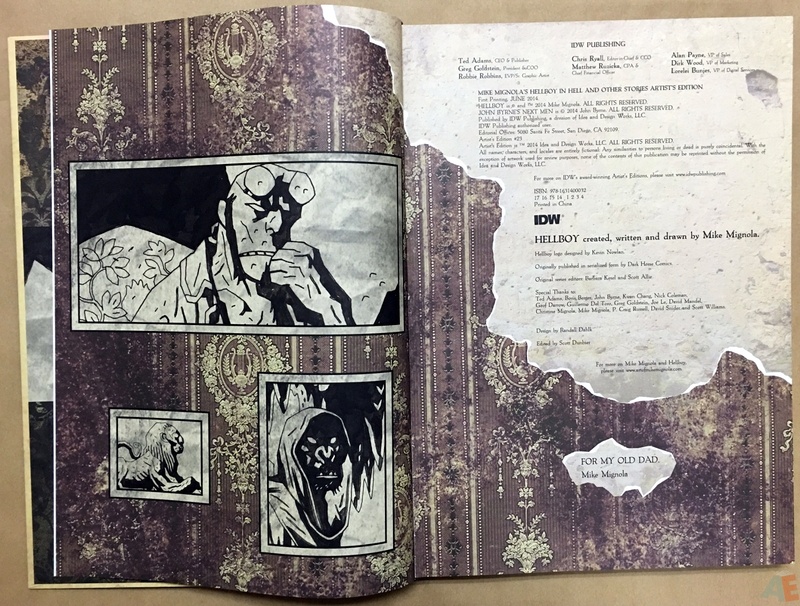 Then I flipped to the next page and saw no text. 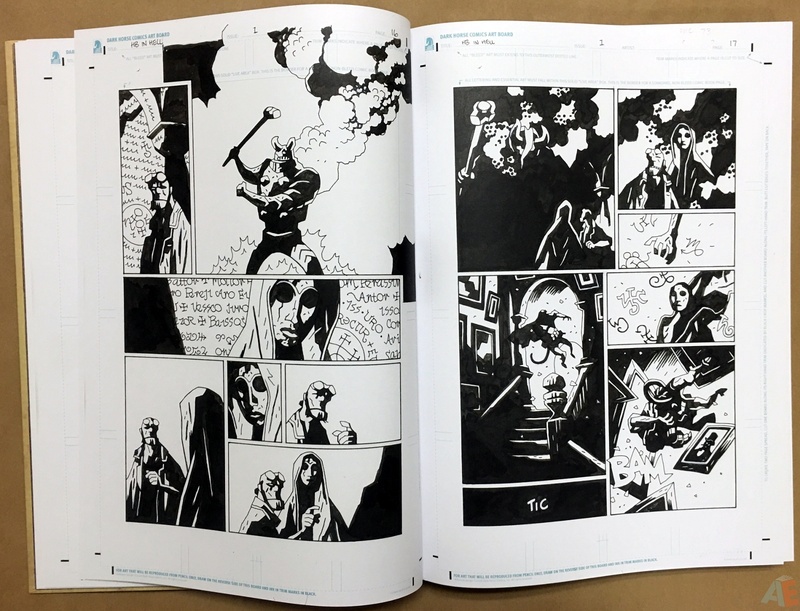 Skimmed the full 121 pages of Hellboy In Hell story and there is no text. 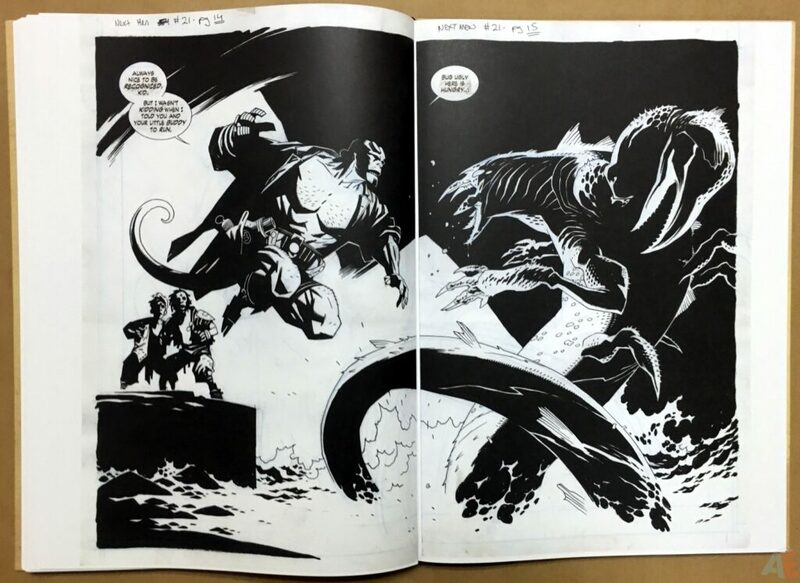 At the time I had hoped they would incorporate the lettering somehow, but that didn’t happen. 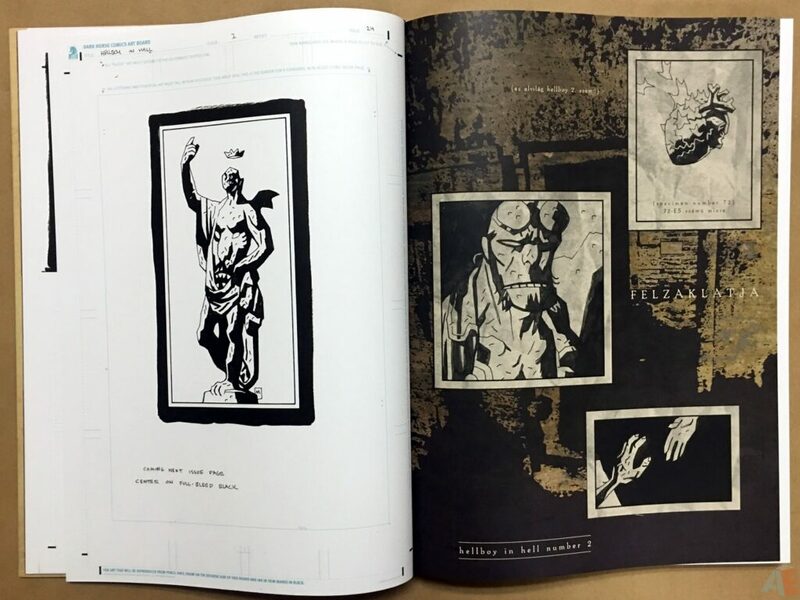 At this point the bulk of this book is a gallery, an art book of Hellboy In Hell and the first Artist’s Edition that can’t be fully enjoyed as a comic book. 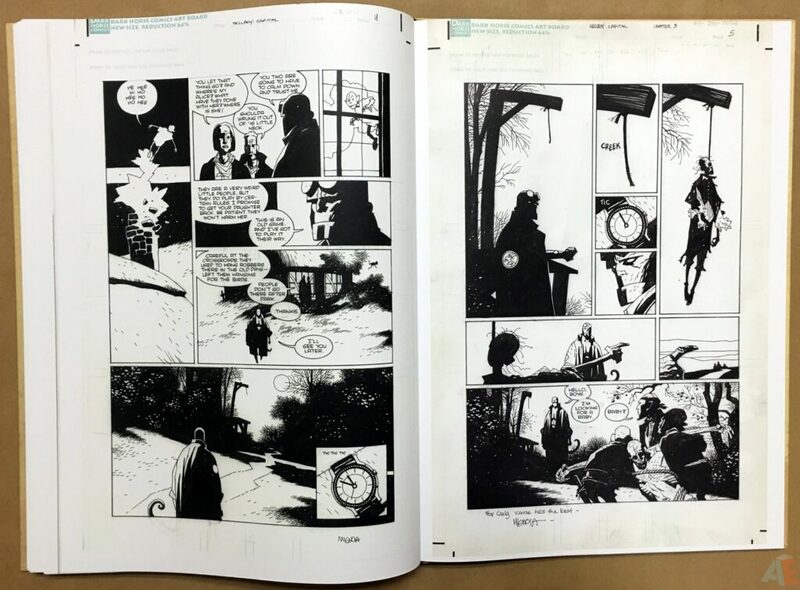 The pages should have been scanned with the lettering acetate overlay in place. 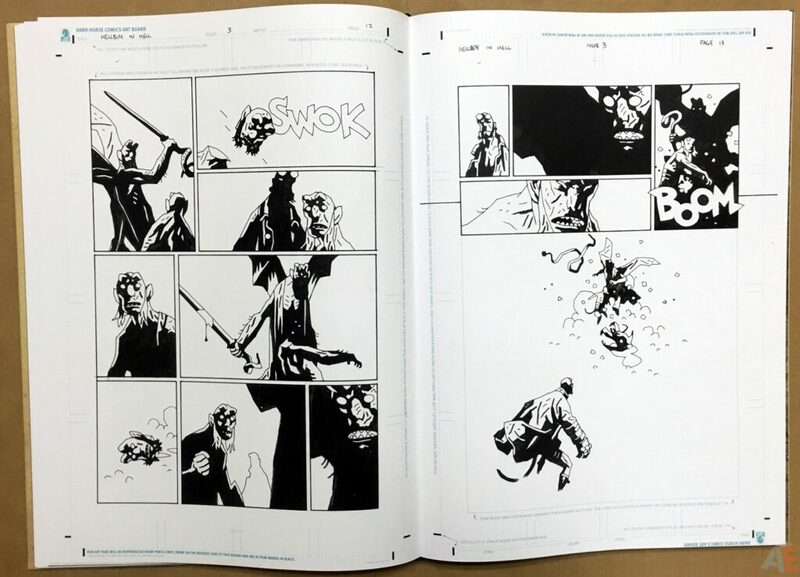 The additional material, four short stories from the dawn of Hellboy and two stories from The Dark Horse Book Of The Dead totaling 63 pages, are the normal penciled, inked and lettered pages we’ve come to enjoy from the Artist’s Edition series. 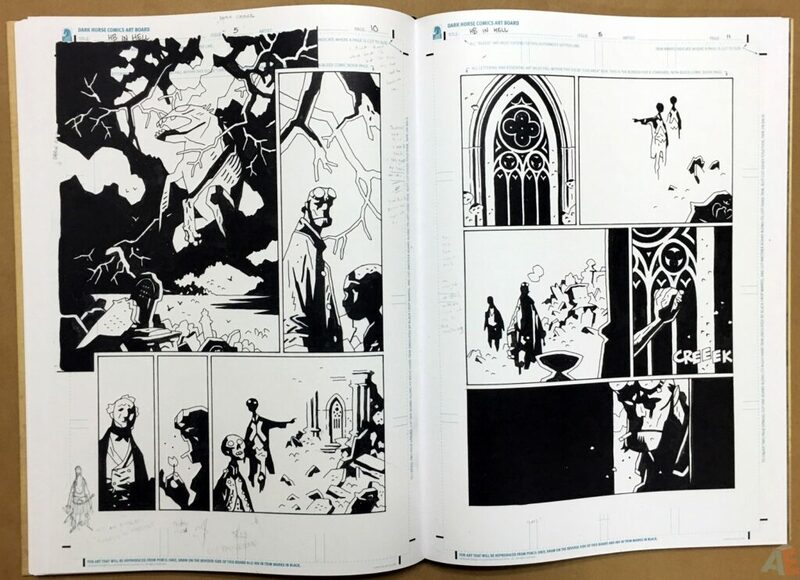 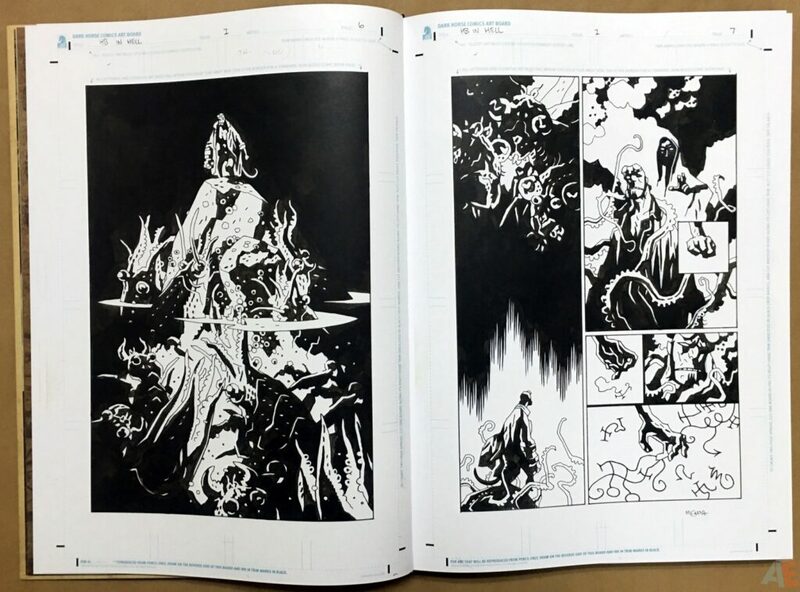 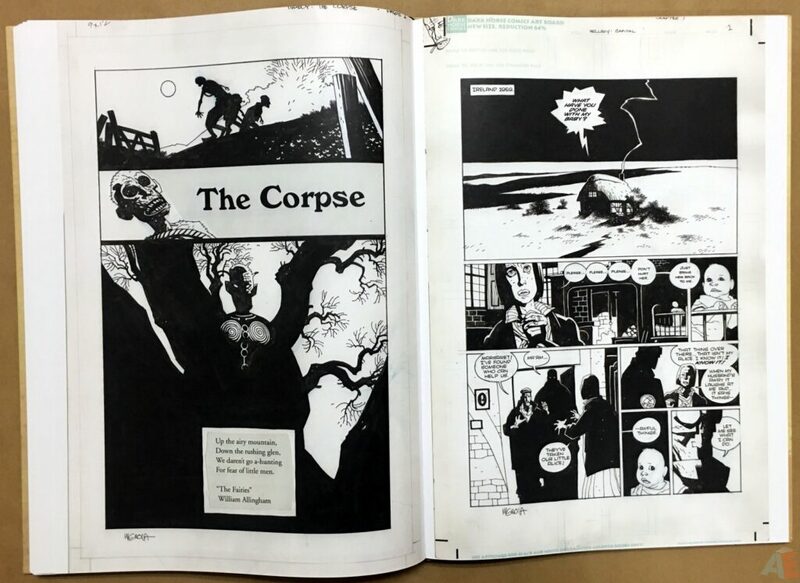 This is scarce material and a treat for Hellboy fans to see it full size, especially those Book Of The Dead stories since the hardcover was quite small. 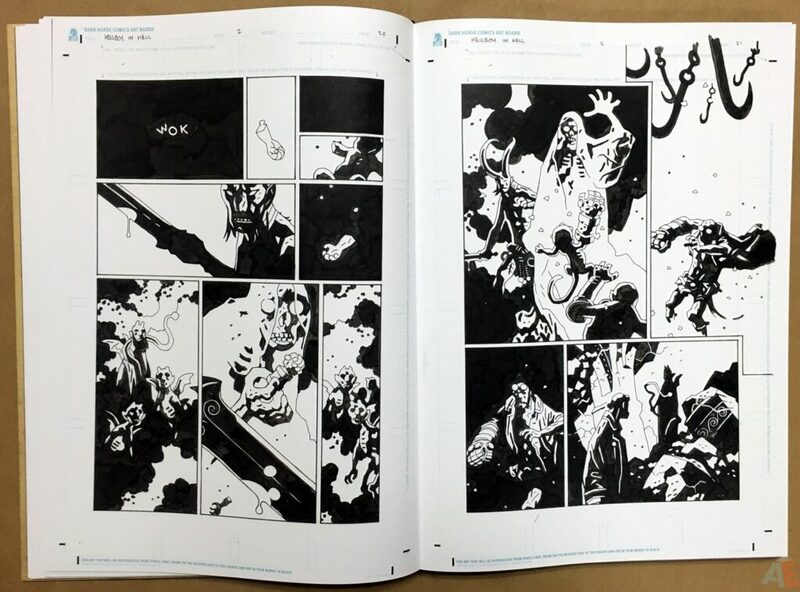 Dahlk has outdone himself on this edition, a completely different concept from any of the previous works. 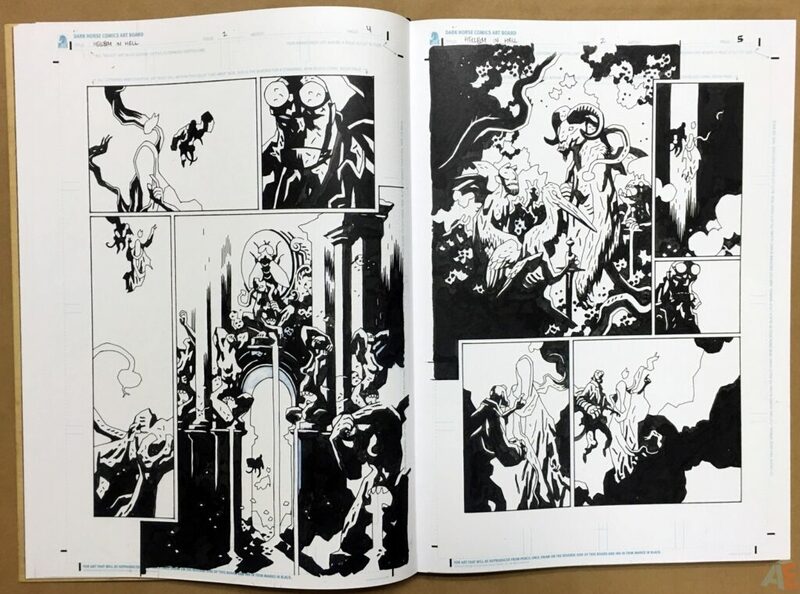 A mixed media of lace, wallpaper, ancient texts and Mignola art give that occult forbidden feel. 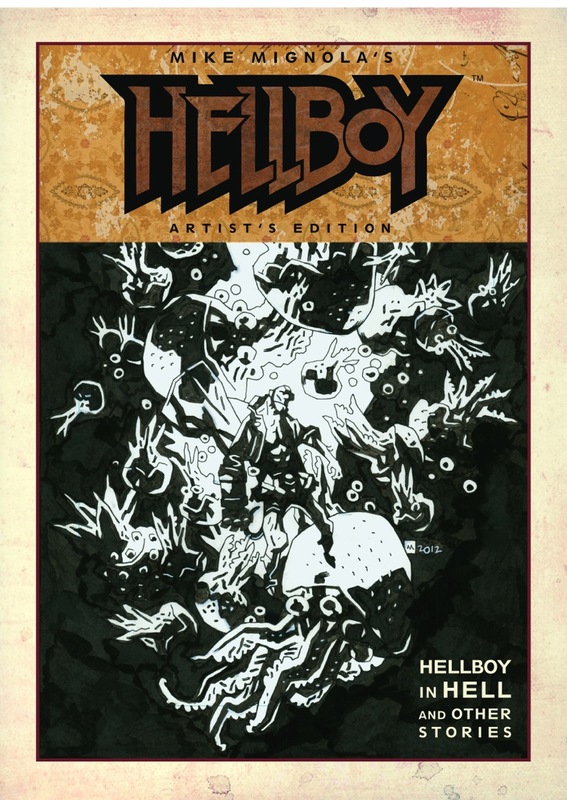 Not sure why Hungarian text is presented throughout as subtitles but then I haven’t read Hellboy In Hell: I was waiting to read it here. 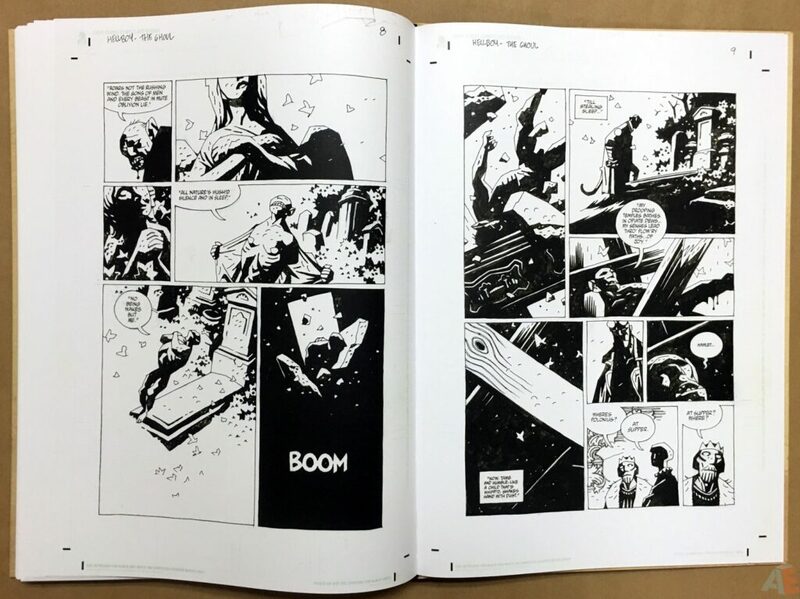 Having no text for the majority of the book is an issue for those of us expecting it to be there, just like the twenty two Artist Editions that preceded it. 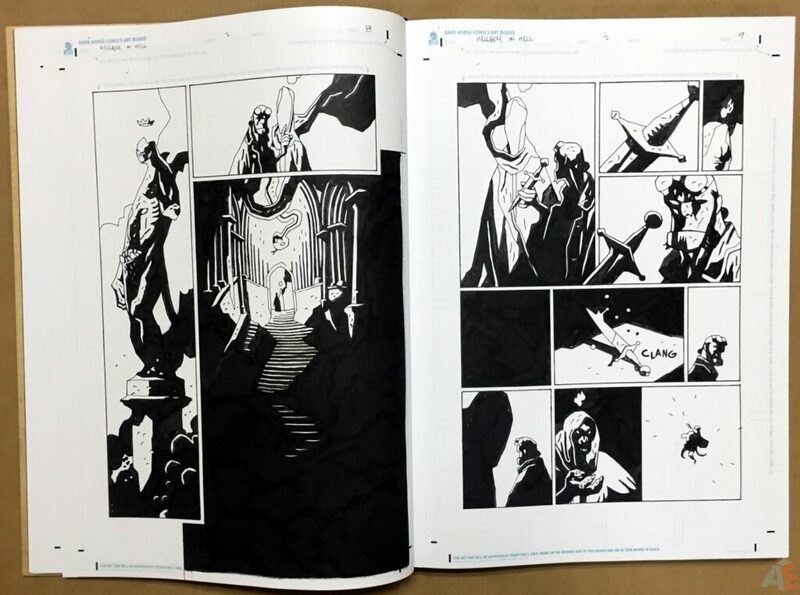 There is no mention in the solicitation from IDW that the art is text free. 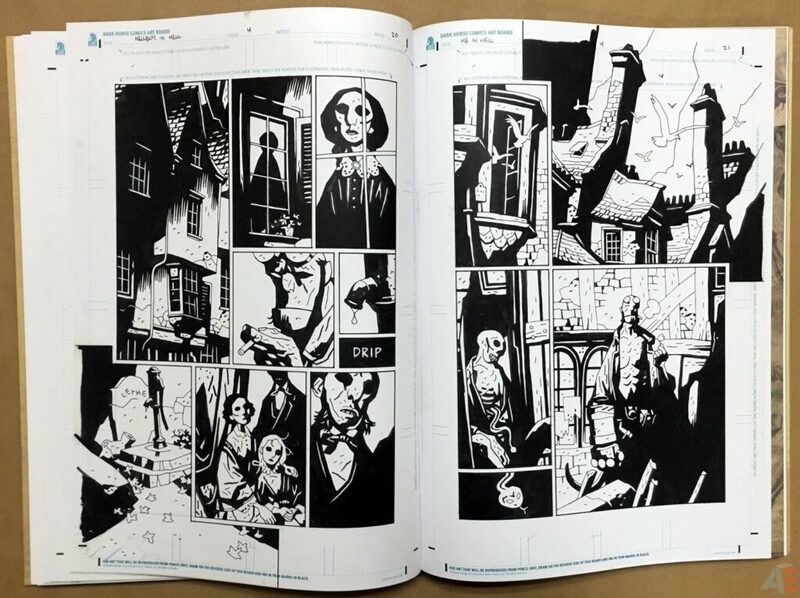 That’s a big deal because these books are expensive and exclusive to comic shops, who for the most part will get these in based on preorders. 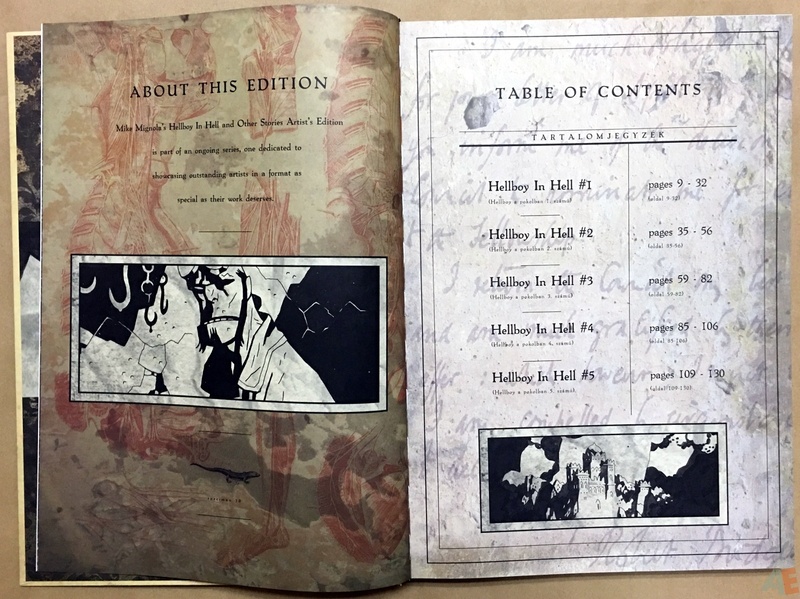 While the first edition is long out of print a new edition was released in 2017, adding a new cover.